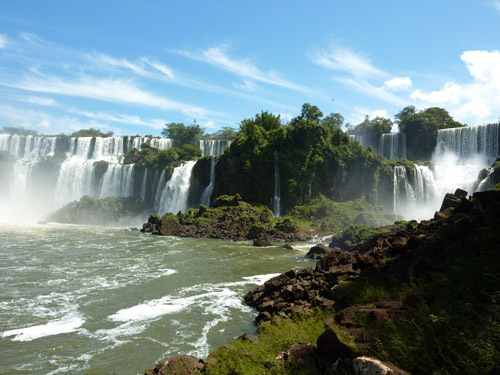 There are two towns called Iguazu; one in Argentina (Puerto de Iguazu) and one in Brazil (Foz do Iguacu). Both towns have their own airports, so you will need to confirm which one you are using if arriving or leaving by air. 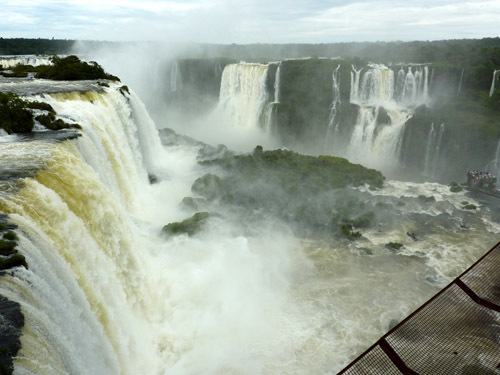 The border runs through the national park, with 70% of the falls being on the Argentine side. Crossing the border is straightforward, but there are some rules you need to be aware of (see later), so visiting both sides is quite viable without problems. 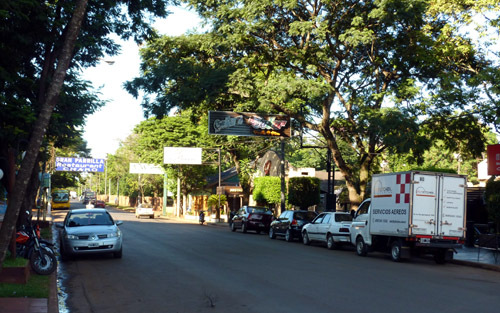 I stayed in Puerto Iguazu, which is the smaller of the towns. It’s a laid back, functional sort of place, some guide books have called it pretty, but I think you would need some fairly heavily rose tinted glasses for this to apply. In the central area there are a few restaurants of a resonable quality, a mini mart, a chemists and a bank (inc ATM). There are other smaller shops along some of the roads on the outskirts but all sell similar stuff (one of them was very specialist, selling only cleaning materials), and there are a couple of tourist places along the road to the falls, selling semi precious stones and stuff like that. It’s worth noting that although the town is quite small it is spread out, and some hotels are along the road to the falls; you would need your own car if you were staying out of town rather than in the centre, so check your hotel’s address on Google. For information; the bus station would be considered to be central. A Piacere: Parilla and pizza. Great steaks and good service. Aqua: Steaks (of course) but also some fish including the local river fish, they also offer some local/ ethnic foods which is interesting: yucca chips… Very good service and explained in English if required. The falls are about 10 – 15km south of town (near the airport) and easily accessible by local bus; services leave the town bus station at regular intervals throughout the day, starting about 7.15am – which will get you to the park in time for opening at 8.00am. Put aside all notions of walking though the jungle and chancing upon the dramatic vista of the falls… this experience has more in common with a theme park, and on public holidays can be horrendously busy. 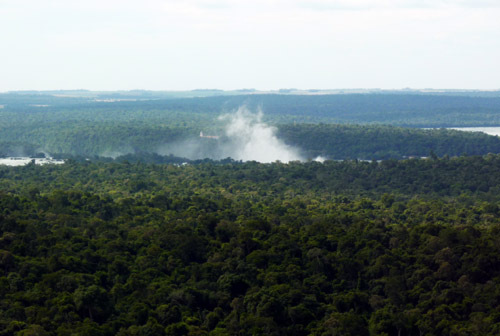 It is however a protected area, and a lot of work has gone in to both protection and education. 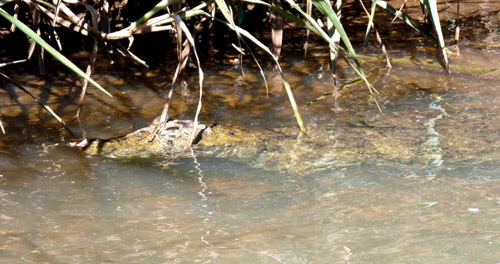 After park entry fees are paid (AR$100) you have some excursion options which provided separately from the entrance fees and by third party suppliers. These vary from an eco boat ride to full on speedboat under the falls, bookings can be made just inside the park after the entrance booths – but if you are considering any of these activities it would be a good idea to book the day before from one of the agents in the bus station, if the park is busy this could save a lot of time. The supplier of these trip is called Jungle Trips, click here for their site, and here for a large version of their map, as below. 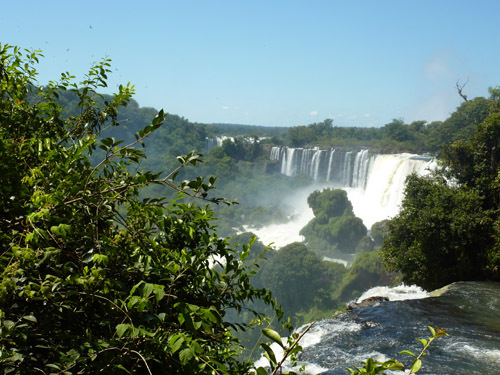 After the Garganta del Diablo there are a few options for the return to the main area of the falls; you can get the train, walk, or take the eco boat trip. I did the latter and thought was very good; a biologist takes the trip and explains all about the flora and fauna, last about 30 minutes. Back in the main area of the park, and within a reasonable walking time of each other, are the upper and lower trails, and an area with food and bars. 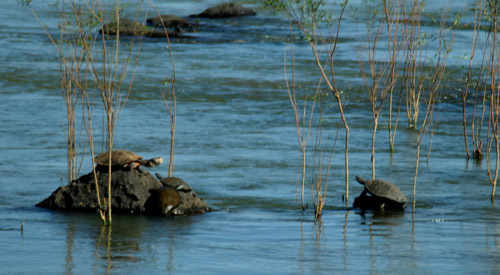 The Sheraton Hotel is nearby – the only hotel in the park. Both trails offer spectacular scenery and ever changing perspectives; there are 2.7km of falls altogether and the views are simply breathtaking. 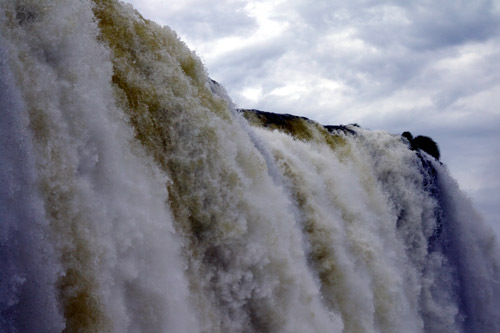 The falls were in high flow when I was there, due to recent rains in Brazil. A normal flow is 1500 cu m/ second, in early March (2011) it was 6500 cu m/ second. The upper trail is right over the top of the falls and the lower gives (I think) better views and feels more dramatic, the lower trail also leads to the boat trip. Both trails pass through jungle and you are for the most part on elevated walkways which reduce your impact on the forest floor, there are explaination notes along the trails and break areas are scattered at intervals. 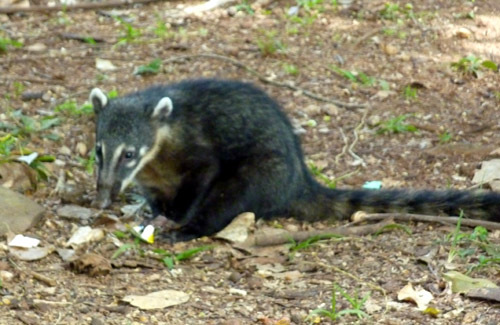 These break areas attract another resident of the park: the Coatis… these cat sized creatures are related to racoons and share the same fearlessness; they will quite happily climb on to your table and pinch your lunch; they are very cute but they bite… be careful. On the last 2 trips you will get absolutely soaked – I am not talking about spray here, I am talking about going under the falls – and that is a lot of water. The crew give you a bag to protect your belongings (it will take a rucksack and is secure) and give you good warning before you get soaked, consider going in swimwear many did… There aren’t many chances in life to get smashed up by one of the worlds biggest waterfalls; so I thought it was worth it – but then I have been called reckless… It was quite an experience but to be honest, its hard to see very much when a few tons of water are being tipped on your head. Note: these boat trips may have been scaled back or stopped, on 22nd March 2011 there was a fatal accident, details here. Food options in the park are quite limited; basic but adequate. There are some other jungle trails available to follow – but you would probably need a second day to make the best of them. More photos here on the original post. 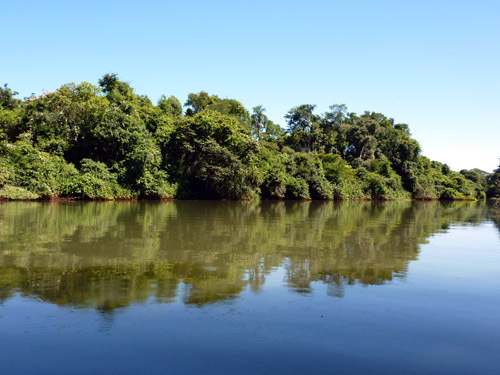 Website for Iguazu here (in Spanish). The bus sets off, and on arival at the Argentine border all passengers get off and go through the passport office; you get stamped and then get back on the bus. At the Brazilian border the driver takes all the passports to the office, gets them stamped and you are in. Half an hour later you are dropped at the park, whole trip time about 50 minutes. Similar procedure on the way back, but I would advise that you get a return ticket and check return bus times, if you get stuck you will need to get back in a taxi. There is one change to the above process if you are NOT going back to Argentina the same day, you MUST get a Brazilian Entry/ Exit card from the Brazilian customs; failure to do so could cause problems when you attempt to leave Brazil. Further note: you must check visa requirements for entry to Brasil, some nationalities (US included) need visas for each entry – and they can be expensive. Brazil has less of the falls, but the best views. The set up on the Brazilian side feels more commercial (if not exactly full on Disney) and the operation is a little slicker than the Argentine side (this might be because the Argentine side has more groups, and so needs less ticket booth arrangements). After payment you board a bus that takes you to one of a few drop off points, most people just go for the full ‘falls’ stop at the end of the road. Unlike the Argentine side you can not walk this; from the payment booths to the falls is about 20 minutes on the bus. On arrival at the falls section there is an approx 2km walk, mostly downhill, and with spectacular views all along the way. 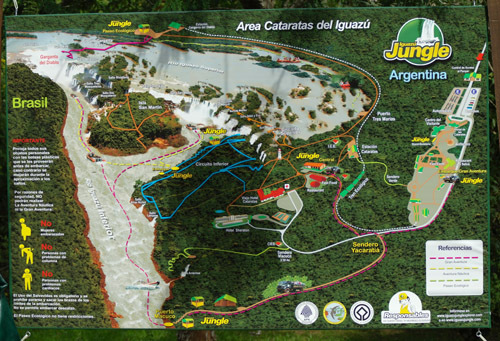 Towards the end of the trail there is a walkway extending to the edge of the falls – giving spectacular views of the Garganta del Diablo.At the end of the trail you catch a lift back to the top of the cliff, the lift is panoramic and right next to a huge waterfall. At the cliff top there are food options and busses back to the entrance. The food options are of the burger type and OK if you want that kind of thing. Back at the entrance there is another small cafe selling an even more limited range of food; their main offer seems to be a cornish pasty looking item, filled with either chicken, cheese or road kill, the weird thing is that instead of pastry, the cover is made of bread – I don’t know if these were representative samples, but frankly it was bloody awful, like trying to eat soggy sawdust. 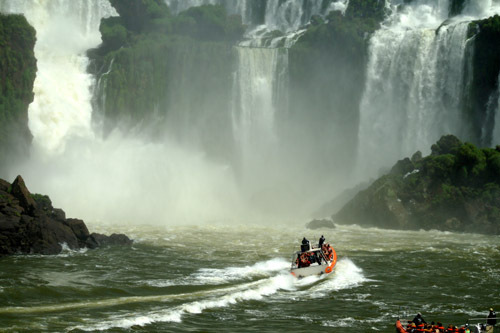 The Brazilian side of the falls can easily be done in half a day; depite the options of rafting and nature trails most people don’t seem to linger if they have already been to the Argentine side. Leaving from the Brazilian airport I had to cross the border again, this time in a taxi due to baggage etc, whilst it cost more than the bus, we did whiz through both border points fairly quickly (queue jumping) and the whole trip was done in under 40 minutes. 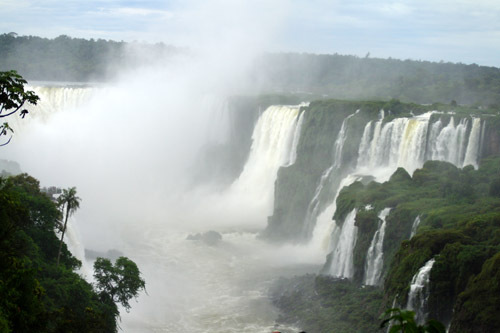 I mention this because if you were to have a late flight, you could fit in a trip to the Brazilian falls before departure. All these arrangements were very easy to make and taxis are available if you don’t want to use busses for any of these trips. 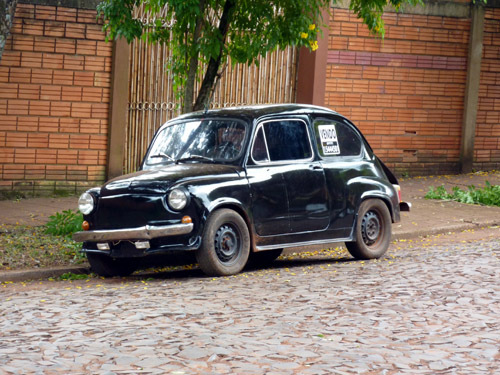 A taxi will even take you over the border for the Brazil side trip – and wait for you, for less than AR$200 return. Before you ask your hotel to make any of these arrangements check with a taxi rank; most of them display prices. Hotels are marking up prices by at least a third; or even telling guests that it is not possible to do certain trips without prebooked taxis… I had no problems at all, I would only recommend allowing more time if it was a public holiday or expected to be busy for some other reason. I would consider coming here again, and would consider staying in the Sheraton next time; certainly for one night. Apparently much of the birdlife returns in the evening when the public have gone – very wise – staying at the Sheraton would allow you to see this better.